Prepare the cake as per their instructions and use the ingredients on the list. When the cake mix is ready, separate two cups and pour into a separate container. Add the cocoa powder and mix with a hand mixer until it becomes coffee colored and tastes like chocolate. Pour the vanilla cake mix into a lightly greased Bundt cake mold and then pour on the chocolate cake mix. Combine with a fork. Bake at 350°F for 30 minutes. When it's ready, remove from the oven and let cool. Remove from the mold and set on a dish. Add 1/4 cup of liquor to this and let it be absorbed. Prepare the glaze by combining all the ingredients together and using a hand mixer. Pour on top of the marbled cake and decorate with whole walnuts. You can use hazelnut or chocolate liquor if you can't find nougat liquor or cream. In Spanish cuisine, it's very common to prepare desserts with nougat, anise or hazelnut liqueur. They're very elegant and perfect for parties and celebrations like Thanksgiving. Pastry making is an art that requires time, but with products like Betty Crocker™, we can save some time in the kitchen and simplify the process. 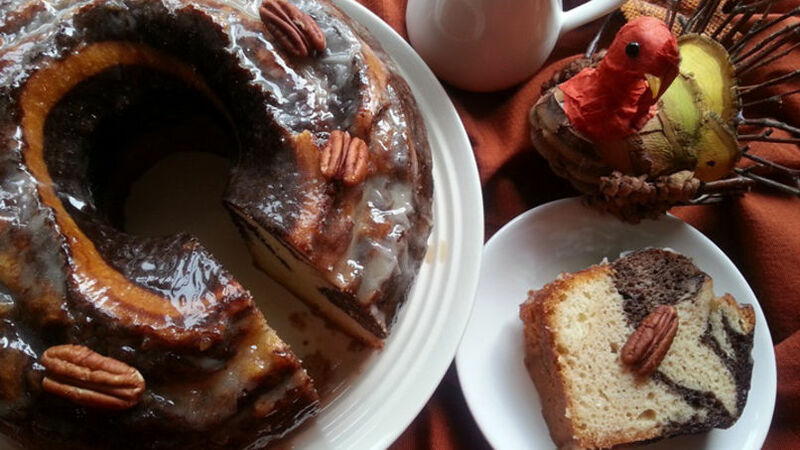 This is why I'm suggesting this east dessert recipe for Thanksgiving: a delicious marble cake with nougat liquor, inspired by the Hispanic dishes of my youth. Enjoy!